One destination that is undoubtedly experiencing a boom in Chinese tourists is Cambodia, a hidden gem in southeast Asia. Cambodian prime minister Hun Sen met with Chinese president Xi Jinping during a visit to Beijing from Sunday to Wednesday and expressed the willingness to work together with China in various fields including trade and tourism. 1.6 million Chinese tourists flocked to Cambodia last year, making China by far the country’s leading source of tourists, well ahead of Vietnam, Laos and Thailand, and accounting for more than 26 percent of the country’s total 6.2 million international visitors. The massive growth has been fueled by increasingly close ties between Phnom Penh and Beijing. “After celebrating the 60th anniversary of Cambodia and China relations, we can also declare that the year 2019 will be the year of tourism exchange between Cambodia and China,” Hun Sen once said at a groundbreaking ceremony for Phnom Penh’s third ring road. 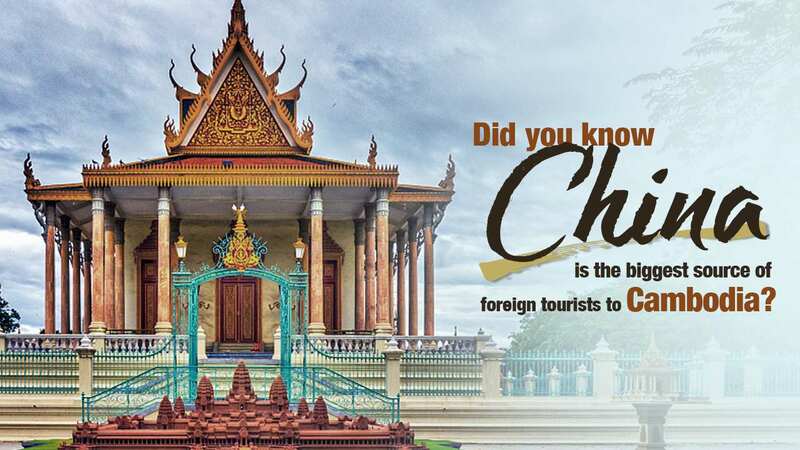 The Cambodian government has launched various initiatives lately, including the “China Ready” plan that outlines a five-year strategy to lure more Chinese tourists by increasing Mandarin speaking services and accepting China’s yuan. Even though getting a visa in Cambodia is currently very easy, the Ministry of Tourism has announced that it’ll soon issue three-year multiple entry visas for Chinese and South Korean citizens. Arrivals at Sihanoukville International Airport, the third largest airport in Cambodia, jumped 115% last year to 338,000, with most of those passengers coming on direct flights from seven Chinese cities. Most recently, China’s major airline operator Air China piloted a direct flight route from Beijing to Phnom Penh early January to help boost the local tourism. Last year, Cambodia hosted upwards of five million tourists and the industry accounted for 32.4 percent of the country’s GDP. It has plans to increase the number of visitors to 12 million by 2025, among which two million are expected from China by 2020. Cambodia has been a vocal about its involvement in the Belt and Road Initiative (BRI) which was launched by the Chinese government in 2013. The (BRI) aims to create an elaborate land and sea railway connection between different countries around the world. China has pledged a 240 million U.S. dollar grant to Cambodia and the two countries signed 13 agreements in a wide range of areas including infrastructure development, trade and tourism. Home to stretches of untouched coastline, palm trees as far as the eye can see and powder white sand which is lapped by a turquoise ocean, Cambodia is a popular tourist destination in the Southeast Asia region. Dubbed as the “Kingdom of Wonders” Cambodia offers tourists spectacular temples, a rich cultural heritage and laid back vibes. Its capital, Phnom Penh, has the buzz of a modern city yet it retains a connection with the region’s Buddhist past with stunning golden palaces and temples. With its inspiring history, Cambodia also attracts tourists from all around the world who often make a beeline for the Angkor Wat temple complex, and other world heritage sites.